There is limited visual 3D information (and thus no proper depth perception) of the surgical area. The surgeon’s eye-hand coordination is distorted because the camera looks at the organ from a different angle than the surgeon would normally do. 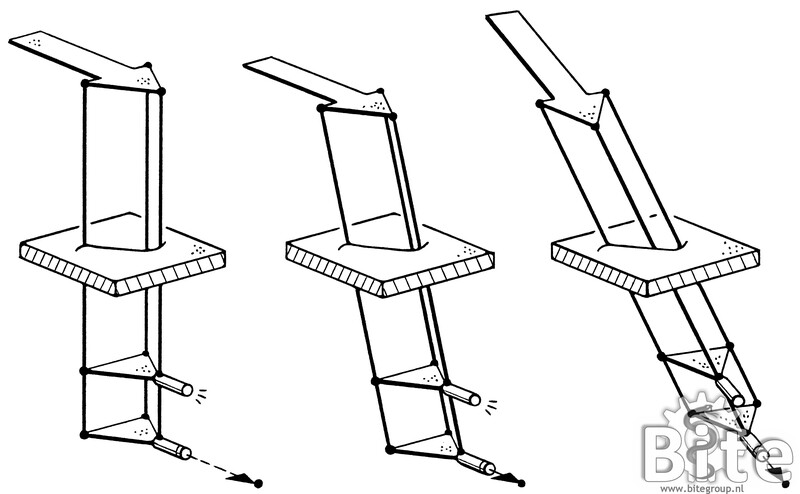 The motion of rigid instruments is strongly limited by the fixed position of the incisions. The surgeon’s ergonomic position deteriorates due to the use of long and rigid instruments in combination with fixed incision points. One way to obtain more depth information is to enable motion parallax – obtaining depth information by mutual displacements of objects in the field of view when moving the eye while keeping the viewpoint in focus. With conventional rigid endoscopes, however, moving the endoscope results in the viewpoint to shift away as the endoscope rotates around its incision point. During his stay in the Hirose & Fukushima Laboratory, Tokyo Institute of Technology, Paul Breedveld and Shigeo Hirose developed an endoscope with a steerable parallelogram mechanism, enabling motion parallax and facilitating eye-hand coordination. This resulted in the first steerable endoscope of the BITE-Group – the Endo-Periscope I.
Wentink M., Breedveld P., Stassen L.P.S., Oei I.H., Wieringa P.A. (2002). A clearly visible endoscopic instrument shaft on the monitor facilitates hand-eye coordination. Surgical Endoscopy, Vol. 16, No. 11, pp. 1533-1537. Wentink M., Breedveld P., Stassen L.P.S, Oei I., Wieringa P.A. (2001). 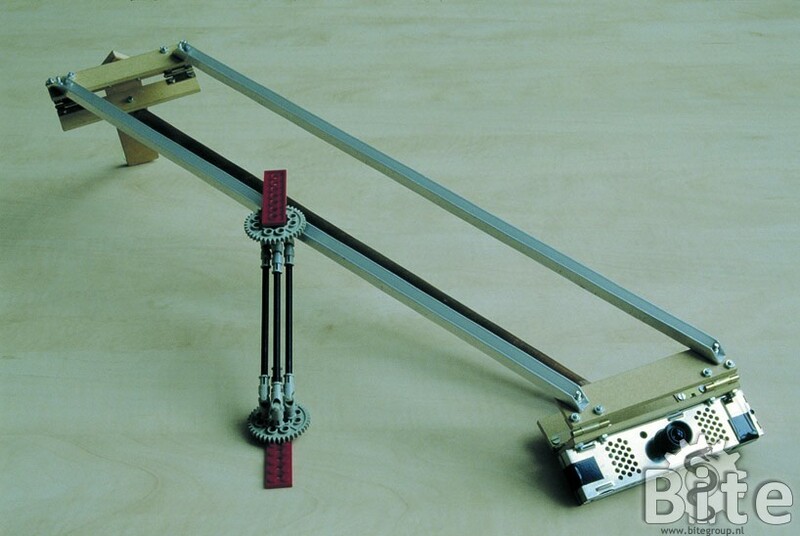 Visible instrument shaft improves laparoscopic manipulation. Proc. 9th International Congress of the European Association for Endoscopic Surgery (EAES), June 13-16, MECC, Maastricht, the Netherlands, p.111. Wentink M., Breedveld P., Wieringa P.A. (2001). Frames-of-reference for handeye coordination during minimally invasive surgery. Proc. Dutch Annual Conference on BioMedical Engineering, Oct. 8-9, Papendal, the Netherlands, 2 p.
Wentink M., Breedveld P., Meijer D.W., Stassen H.G. (2000). Endoscopic camera rotation – a conceptual solution to improve hand-eye coordination in minimally invasive surgery. Minimally Invasive Therapy and Allied Technologies, Vol. 9, No. 2, pp. 125-132. Breedveld P., Stassen H.G., Meijer D.W., Jakimowicz J.J. (2000). Observation in laparoscopic surgery – overview of impeding effects and supporting aids. Journal of Laparoendoscopic and Advanced Surgical Techniques, Vol. 10, No. 5, pp. 257-267. Wentink M., Breedveld P., Stassen H.G. (2000). Use of a flexible endoscope in minimally invasive surgery improves a surgeon’s depth perception. Proc. 23th European Conference on Visual Perception, August 27-30, Groningen, the Netherlands; In: Perception, Vol. 29 supplement, p. 33. Wentink M., Breedveld P., Overbeeke C.J., Wieringa P.A., Stassen H.G. (2000). Hand-eye coordination strategy during minimally invasive surgery – cartesian vs polar perception-action mapping. Proc. Dutch Annual Conference on BioMedical Engineering, Oct. 9-10, Arnhem, the Netherlands, pp. 144-146. Breedveld P., Stassen H.G., Meijer D.W., Jakimowicz J.J. (1999). 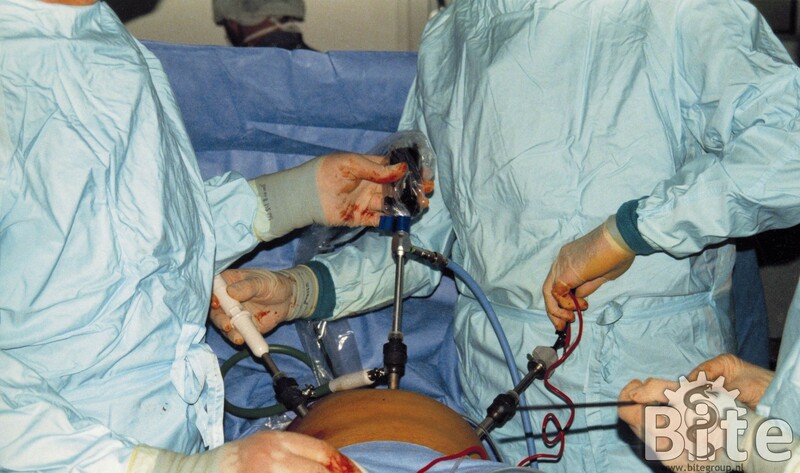 Manipulation in laparoscopic surgery – overview of impeding effects and supporting aids. Journal of Laparoendoscopic and Advanced Surgical Techniques, Vol. 9, No. 6, pp. 469-480. Breedveld P., Stassen H.G., Meijer D.W., Stassen L.P.S. (1999). Theoretical background and conceptual solution for depth perception and eye-hand coordination problems in laparoscopic surgery. Minimally Invasive Therapy and Allied Technologies, Vol 8, No. 4, pp. 227-234. Breedveld P. (1999). Spatial perception and manipulation in laparoscopic surgery – problem overview and technical solution. Proc. International Training and Education Conference (ITEC ’99), Medical Simulation and Education Session, April 13-15, Netherlands Congress Centre, the Hague, the Netherlands, pp. 63-67. Breedveld P., Stassen H.G., Meijer D.W. (1999). Improving depth perception and eye-hand coordination with a flexible 90o endoscope. Proc. 7th International Congress of the European Association for Endoscopic Surgery (EAES), June 23-26, Design-Center, Linz, Austria, p. 12. Breedveld P., Stassen H.G., Meijer D.W. (1999). Eye-hand coordination in laparoscopy – how it is and how it should be. Proc. 7th International Congress of the European Association for Endoscopic Surgery (EAES), June 23-26, Design-Center, Linz, Austria, p. 13. Breedveld P., Stassen H.G., Meijer D.W. (1999). Depth perception in laparoscopy – 3D vision is more than stereovision. Proc. 7th International Congress of the European Association for Endoscopic Surgery (EAES), June 23-26, Design-Center, Linz, Austria, p. 13. Breedveld P., Lunteren A. van, Stassen H.G. (1999). 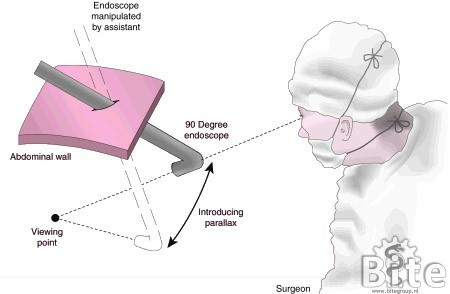 Elimination of misorientations and introduction of movement parallax in laparoscopic surgery. Proc. 18th Benelux Meeting on Systems and Control, March 3-5, Houthalen, Belgium, p. 160. Breedveld P., Lunteren A. van, Stassen H.G. (1998). Improvement of depth perception and eye-hand coordination in laparoscopic surgery. Proc. 7th IFAC Symp. on Analysis, Design and Evaluation of Man-Machine Systems, Sept. 16-18, Kyoto International Conference Hall, Kyoto, Japan, 6 p.
Breedveld P., Lunteren A. van, Stassen H.G., Meijer D.W. (1998). Compensation of misorientations to improve the eye-hand coordination of the laparoscopic surgeon. Proc. 10th Annual International Meeting of the Society for Minimally Invasive Therapy (SMIT), Minimally Invasive Therapy and Allied Technologies, Vol. 7, Supp. 1, p. 10. Breedveld P. (1997). Observation, manipulation, and eye-hand coordination problems in minimally invasive surgery. Proc. 16th European Annual Conference on Human Decision Making and Manual Control, Dec. 9-11, University of Kassel, Kassel, Germany, pp. 219-231.